Looking for details on a RAF(VR) officer not listed here yet? Only RAF officers of ranks below Air Commodore will be shown here in detail. Abbreviations and explanations can be found at the help page. Son of Albert Waddington (1869-1937), and Louisa Montier Strange (1872-1952). Son (with one brother and two sisters) of James William Wade (1875-1941), and Daisy Margaret Clarke (1892-1965). His son writes: "After returning from Dunkirk he transferred to the R.A.F. learnt to fly in Canada. On return to England flew with Coastal Command in the Med. Took part in the Burma Campaign. At the end of the war after being de-mobbed flew with B.E.A. from Lands End, Cornwall to the Scilly Isles. Took part in the Berlin Airlift flying from Exeter. Left B.E.A. after a short spell as a publican, joined the Colonial Police and went to Malaya in 1951. Returned to England in 1957 at the end of his contract, successfully applied to join the R.C.M.P. but unfortunately died of a heart attack before going to Canada." 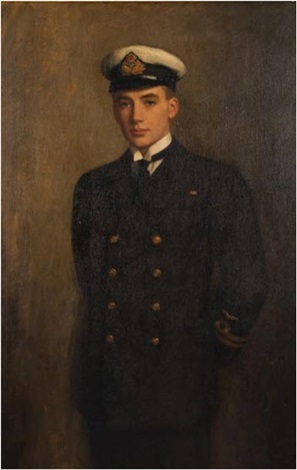 Son of John Aspinall Wadsworth (1882-1960), and Helena Hoskin (1883-1969). Married (04.1945) Molly Cleevely (died 1999); one son, one daughter. * This officer has undertaken a large number of sorties and his navigational ability throughout has been outstanding. On 2 occasions in September, Squadron Leader Wagland participated in sorties which demanded skill and determination of a high order. In addition to his good work in the air, Squadron Leader Wagland has rendered excellent service in the training of other members of aircraft crew. Of St Albans, Hertfordshire. ? * This officer has achieved much success in attacks on shipping, railway communications and mechanical transport. He has displayed the greatest determination throughout and his example in the face of the enemy has been most inspiring. One night in June, 1944, he attacked a small convoy and caused the destruction of a lighter. The following night, Flight Lieutenant Walker participated in a most successful attack on a small convoy consisting of 10 small craft, all of which were attacked with destructive effect. His keenness and devotion to duty have been outstanding. Education: Heath Grammar School, but left early to join his father's building firm. Son of ... Walker, and ... Collins. Husband of Margaret E. Walker, of Southgate, Middlesex. 1911 ? Son of Maj. Louis E. Walker, and Edith Smith, of Ditchling, Sussex. 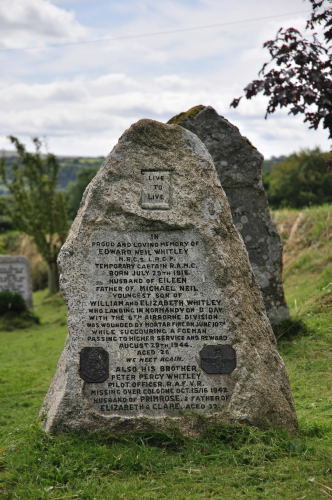 Married (08.1941, Newton Abbot district, Devon) Claudine Ella "Coy" Mawby (10.08.1922 - 13.09.2012); seven children. Joined his father in the brewery trade (ending up as Chairman of Ind Coope). He returned to flying after six months’ treatment, joining an aircraft ferry unit before transferring to No 116 Squadron on anti-aircraft co-operation duties. Son of ... Wallace, and ... Reeve. Married; ... children (one son?). Son (with three brothers and two sisters) of Samuel Hendrik Walters (1892-1980), and Vera Dagmar Ellin Mercer (1892-1956). Married 1st Noel Mary Cochrane Pare; one son. Son of George Walton, and Rebecca Shaw. Son of Louis Walton, and Martha W. Coltart. His son writes: "My father was sent to Toronto, Canada, to learn to fly (where he met my mother) after the war started. His flight logs first entry is January 1, 1941, the aircraft is listed at DH 82A which is a De Havilland Tiger Moth. His last entry in the log book is Aug 19, 1952 in a Prentice. He flew missions on D-Day in a Spitfire giving cover on the beaches. He was shot down 3 times and the third time he was captured by the Germans and was held in Stalag Luft III (shortly after the great escape) where he was a POW from July 1944 till several of them escaped when the Russians took over the camp." Education: Guisborough Grammar School; St John’s College, York. Youngest of three sons of Charles Arthur Wareing, and Jane Ellen Hodson. Education: St Philips Grammar School. Wareing is listed as first pilot on DW110 when it crashed though reports say he was not in the cockpit at the time. They were on anti-submarine patrol and could not return to base at Pembroke Dock and were re-directed to Castle Archdale, Ireland; they slammed into the mountain side in poor weather. Memorial website is www.freewebs.com/dw110 Those killed were F/Lt Charles Armstrong DFC S/No 42383, F/Lt Maurice Gillingham 104369, Sgt Cyril Greenwood 1129218, F/Sgt Frederick Green RCAF R/184005, Sgt John Parsons 1315937, Sgt Frederick Copp 614970. Survivors were F/O Joseph Trull 128117 (later to die on 11 December 1944 in another Sunderland which exploded), W/O John Richardson 523921, Sgt C S Hobbs 1644857, Sgt James Gilchrist 1338328, F/Sgt A Gowans 105592. The deeds of the crew are mentioned in John Quinns "Down in the Free State" which gives and account of the incident when Armstrong got his DFC also the history of the crash is recorded in the book "The World War II aeroplane crash in the Blue Stack Mountains" by Liam Briody. The Blue Stack Ramblers take regular guided tours to the site of the crash and the memorial stone, there is still the wreckage of fuselage and engines all over the site. Son of Sophus and Fanny Heath Warming, of Reigate, Surrey. Son of Stanley William Phelps Warner and Lucy Isabella Corson. Son of John Watkin Warren, a land agent & surveyor, and Irmgard Margherita Walburga Ziegler, of Wood Park, Northwood, Middlesex. Son of George and Louise Warren, of Slough; husband of Aline Jeannette Warren, of Slough. Joined the Civil Service and employed at the Air Ministry, 1938. Son (youngest of six, with one brother, four sisters) of Charles King Watkins, a vicar, and Margaret Underwood. Married 1st (divorced); one daughter. Married 2nd (1959); one daughter. Engineer at Raleigh’s near Derby. Son of James and Rebecca Watson, of West Linton, Peebleshire. Son (with one sister) of George Wallace Watson, and Amy Appleby. Served Army Service Corps (Pte., 08.1914), 4th Dragoon Guards (2nd Lt.; 12.1914-1916), Royal Naval Air Service (F/S.Lt. ; 1916-1918), RAF (Lt.; 01.04.1918-1919) & 99th Royal Field Artillery (Territorial) (1922-?). Son of George W. and Catherine Webster, of Newcastle-on-Tyne. 1921 ? Worked for Dorland's ad agency after the war (probably in New York) and was very likely with them in London before it. Son (with five sisters and one brother) of Joseph William Weight (1878-1958), and Hannah Mary Nash (1878-1945). Son of ... Weiss, and ... Weisman. Son (with two sisters) of Brig.Gen. Malcolm Hammond Edward Welch, CB, CMG (1872-1946), and Irene Frances Elphinstone. Returned to Farnborough to work on rocket motors before becoming chief instructor of the Surrey Gliding Club at Redhill, a test pilot for new aircraft for the British Gliding Association and a British team pilot in four world championships. Education: Otago Boys High School (1925-1928); Otago University (Bachelor of Commerce, 1936). Businessman. Served on the College Board of Governors, Selwyn College, NZ, from 1947 to 1978. Fellow of the College. Son of Eric Francis Vesey Wells (1885-1933), and Marjorie Louise Gregory (died 1958). Married (late 1940s, Kenya) Jessie Theresa Coster; one son, one daughter. Son of Ernest R. Welsh, and Jessie Jarvis. Son of Robert T. West, and Florence Grace W. Bates (1883-), of Bolton, Lancashire. 1921 ? Son (with one brother and three sisters) of Rev. Percy Moss Weston (1878-1957), and Margaret Ellen Edgson (1886-1958), of Malvern Link. Married Dorothy ... (predeceased him). 1916 ? Education: Bangor, North Wales (BSc, 1948). Chief Forest Officer, Northern Ireland Forest Service, 1950-1952. Former Forestry Officer for Hambleton District and Deer Patrol Officer for the North of England. Son (with two brothers) of Mr. and Mrs. Thomas John Weston. Education: Ebbw Vale Grammar School; Cardiff Univeristy (BA (Hons); Education); Sorbonne University, France. Assistant Master, Wallingford-on-Thames Grammar School. Master, Queen's College of Guyana, 1935-1941. Arrived back in UK 06.10.1941. * Mr Eric Jones wrote: "On 31 August 1943, P/O Weston and his pilot, P/O Bernard Walter Jobling, received orders to carry out a night flying test in their Mosquito Night Fighter 2. They took off that day from Hunsdon airfield, Hertfordshire, and on their way to the test area, flew over P/O Joblin’s service quarters where his wife could be seen in the garden. The pilot playfully waggled the aircraft’s wings in greeting to her before opening wide the aircraft’s throttles and steering into a climbing turn. Suddenly and without warning the aircraft stalled and plunged helplessly downwards completely out of control. It crashed into the fields of the nearby Olives Farm, Stanstead Abbott, Hertfordshire." Son of Frank Weston, an Anglican Missionary, and Dorothy Byatt. Education: Selwyn College, Cambridge (Mechanical Sciences Tripos, Class II, 06.1940; MA). CEng, AFRAeS. Technical officer with the British Standards Institution. Son of Albert Alfred Weyer, and Sarah Anne Garood. Married 1st (29.09.1923, Croydon district, London) Doris Elizabeth Harrison (27.06.1903 - 10.02.1995), daughter of Frederick William Harrison (1876-), and Edith Laycock (1878-); ... children (one daughter, one son). Played cricket (Surrey Second XI (Minor Counties Championship: 1921-1923); Mitcham (Miscellaneous: 1919)). Son of Mr & Mrs Charles Whiffen. After the war he served in Malaya and ended up as Commanding Officer of the Royal Malayan Air Force until 1961 flying Harvards. Born as Jack Maxwell W. Leslie as son of Norman Leslie, a motor company's traveller from Adelaide (Southern Australia), and Kathleen Davidson. Adopted (27.11.1913) by Harry Scott Whiting and Mary Louisa Lewis. Son of William Whitley, and Elizabeth Whitley. Brother of Capt. Edward Neil Whitley, MRCS, LRCP, RAMC (1918-1944). Son of Henry Whitmill, and Annie Gardiner. Son of Tennyson Wilberforce, and Mabel Woods. Married ((06? ).1935, Wandsworth district, London) Enid Gwyneth Williams, of Welbourn, Lincolnshire. 1913 ? Married ...; ... children (one son?). * Sgt. Wilkinson has proved himself an outstanding member of a gallant crew, He has had a varied experience of attacks on targets in the Rhineland, at Kiel, Hamburg, Rostock and Warnemunde and in France. Son of Dudley George Wilkinson (1879-1954), and Muriel Octavia Dearle (1886-1944). Married 1st (20.05.1939, Uxbridge, Surrey Mid Eastern district; marriage dissolved 1950s) Barbara Kathleen Read (08.12?.1918 - 07.2002), daughter of ... Read, and ... Quinnell; one son. Barbara Wilkinson remarried (1954) Neville S. Jacobs. Education: Collegiate School, Georgetown; Lodge School, Barbados; St. Jean Berchmans College, Antwerp, Belgium. Director, Willems Timber and Trading Co., Ltd. Son of John Isaac and Elizabeth Williams. A grandchild writes: "He served as a member of bomber command possibly as a trainer. His commander was Anthony Kimmins according to a letter and telegram my grandmother received during the war. At one point he was stationed at Catterick. I also have a photo of him on board HMS Bulolo." Son of Thomas Latimer Williams and Margaret Rose Williams, of Crynant, Glamorgan. 1922 ? Son (with two brothers and one sister) of Charles Henry Williams (1864-1953), and Kate Reynolds (1878-1956), of Manor Park. Son of Frederick and Mary Williams. Husband of Evelyn Annie Williams, of Ranskill, Nottinghamshire. 1922 ? Third of four sons of Frank and Margaret Williams. Married (08.02.1930, Cardiff) Nellie Lewis, of Cardiff; two sons. Son of Gp.Capt. Francis George Maxwell Williams, RAF, and ... Wallace. Youngest son of Ernest Willis, and Ethel Maud M. Jeeves, of Ealing. * This officer has proved himself to be an efficient and resourceful captain of aircraft. He has participated in a large number of sorties, including many attacks on enemy shipping during which he has achieved notable successes. This officer has at all times displayed the highest standard of devotion to duty and his record is one of persistent and determined endeavour. Clerk. Son of Sidney Charles Willis, and Ethel M. Willis. Education: King Edward VI School, Stratford-upon-Avon. Son (with three sisters and one brother) of Hugh Michael Willoughby (1885-1967), and Mona Emily Munn (1890-1953). Education: St Anthony's Academy, Port Antonio; Cornwall College, Montego Bay. Son of Robert Early Willson and Dolcie Powell Willson, of San Antonio, Texas, U.S.A. 1919 ? Literature: Dolcie Suggs Ehlinger & Karen Guelfo Ehlinger, Letters from my son : a Texas boy's journey to the RAF (2011). Son (with a twin brother and three other brothers) of Frank Arthur Wilmer (1878-1956), and Florence Beatrice Williams (1883?-1922). His father remarried (1922) Ada M. Pollen. Married 1st ((03? ).1944, Kensington district, London) Joan M. Farrow. Education: Bristol University (electrical engineering). Went into the film industry post-war, later into farming in Essex. Son of the late Rev. Canon James Maurice Wilson, DD, MA, and Georgina Mary Wilson. of late C.H. Ashton of Ellesmere; one son, one daughter. Deputy Chief Political Officer, Indian Expeditionary Force "D"
Knight of Grace, Order of St John of Jerusalem, 02.12.1919; Justice of the Peace (JP); late Indian Political Department. Son of Charles Thomas Wilson and Alice Maude Wilson, of Kingsbury, Middlesex. Husband of Kathleen Wilson (died 1939), of Osgodby, Lincolnshire; one daughter. Son of Frederick John and Florence Emily Wilson; husband of Eileen Elsie Wilson, of Sevenoaks, Kent. (T) F/Lt. ? 1945/46 ? Son (with three brothers and one sister) of Theodore Norman Winning, KC (1884-1946), barrister-at-law, and Florence Marshall Bonner (?-1955). Brother of Sq.Ldr. Deryck Selkirk Winning, RAF. His brother Sgt. William Burton Cecil "Borton" Winning, RAFVR (born 04.11.19??) , was missing, presumed killed 06.01.1941. Gained civil aviator's certificate (04.07.1932). Son of William Henry and Irene Rebecca Winter. Son of ... Wise, and ... Jones. Married ((09? ).1922, Kingston district, Surrey) Edna Marie A. Baynham. Son of Harry Joseph Wodehouse, and Ethel May Hudson, of Norwich, Norfolk. Worked in local newspapers until he joined the RAF. BBC football commentator. Entered sports broadcasting in Manchester and commentated on his first televised match in 1948. Well known for his famous quip during the 1966 World Cup Final – ‘…they think it’s all over… well it is now’’. He was a loyal Wanderers supporter. Son of ... Wood, and ... Baker. Son of William and Lilian Wood. Husband of Marie Christine Wood, of Hampstead, London. 1912/13 ? Son of Andrew and Gertrude Wood. Husband of Jean Wood, of Bedford. * For his work in airfield lighting to assist pilots returning from bombing raids to land safely at the airfield. Chartered accountant. Accountant in his father’s firm Monkhouse Stonehan and Co, London Wall. Son of Harry Woodcock, and Maud A. Ainge. Married (02.06.1945, St Giles Parish Church, Sheldon) Phyllis M.F. Eades (born 1918); one son, two daughters. Emigrated to the Philadelphia area (USA), in 1950. He was a linotype printer, retiring from the Philadelphia Inquirer. * Before joining this squadron this officer completed 27 operations, including attacks on such highly defended targets as Berlin, Mannheim, Hamburg and other important places in Germany and German-occupied territory, and on the Channel ports. In the Middle East he has acted as rear gunner on many occasions against targets in Cyrenaica and Crete, and from Malta against Comisq. No duty has ever been too arduous. For the past few months he has been employed as squadron leader. By his zeal, skill and personality he has established a high standard of air gunnery in the squadron. He still insists on flying with new crews as rear gunner on their first operational mission. Son of William H. Woods, and of Kate Dora Woods, of Harborne, Birmingham. Son (with two brothers) of Arthur Harold Woolveridge (1881-1955), and Ethel Beatrice Tewson (1882-1971). Son (with two sisters) of Frederick Percival Wormald (1888-1930), and Nellie Gertrude Matthews (1892-1963). His son writes: "Served AMES 252 and AMES 220. Also in Middle East until 1943." Son of ... Would, and ... Bulman. Son of William L. Wraight, and Grace Winifred B. Noyce. Son (with three brothers and two sisters) of Sir Francis James Wylie, MA, LL.D. (1865-1952), and Lady Wylie (Kathleen Kelly) (1882?-1969), of Boar's Hill, Oxford. Education: Oriel College, Oxford (masters degree in forestry). Emigrated to Canada, 1950, settling in Prince George, B.C. in 1952, where he worked in a variety of forestry and lumber related jobs until retirement.